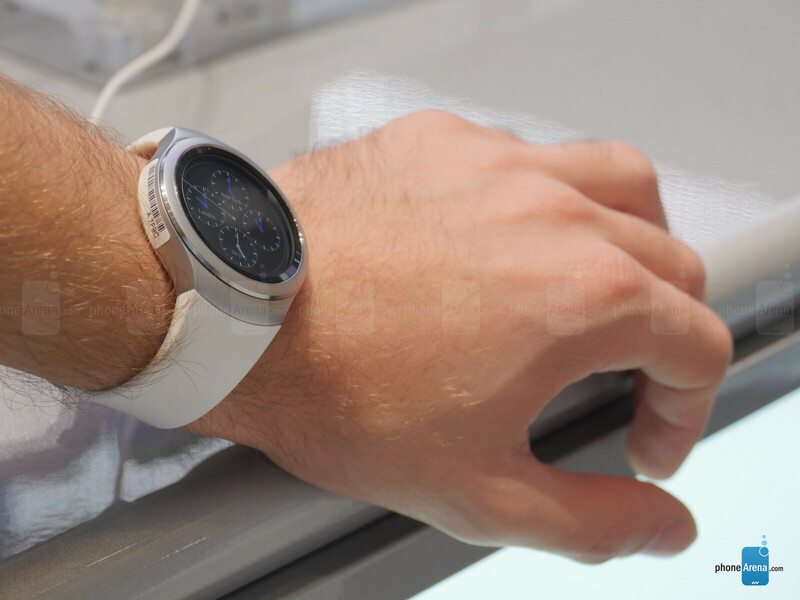 Samsung promised that it's going to bring a snazzy new wearable to IFA, and it has kept its promise. What's more, the company has even managed to surprise us by revealing what might very well turn out to be the best smartwatch of 2015. And when we remember that it was this year that the much-anticipated Apple Watch debuted, all of a sudden, that eventual title starts sounding all the more impressive. Last year's Gear S came and went relatively quietly, but with the new Gear S2 and Gear S2 classic, Samsung shows us that it's actually beginning to get ridiculously serious about this whole smartwatch thing, and especially its rivalry with Apple. Why do we say this? Read on and you'll know why! 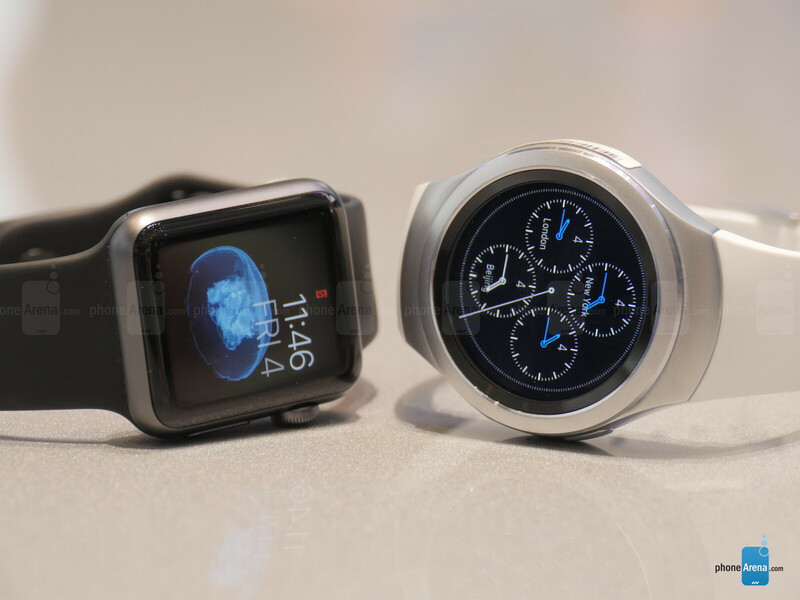 Samsung has been among the earliest proponents of smartwatch technology, even in recent history, where it's been making persistent efforts of getting a solid foothold with its Galaxy Gear (and later simply Gear) watches. However, we can't really say that the wearables market has been exactly booming these last few years, but things are surely changing now, with the advent of Apple's first wearable, the Watch. Having been off to a bumpy start, though, the Apple Watch seems to be just a bit on the underwhelming side when it comes to its style and functionality attributes. Still, the relative success of the Apple Watch seems to have motivated Samsung to step up its smartwatch game dramatically. Forget what you know about the Gear, this new Gear S2 watch is a completely different take on the wearable, and we have the feeling that Samsung has nailed it this time. But as timepieces tend to be seen as fashion accessories by many, it's downright crucial for a contemporary smartwatch to exude a premium style, all the while serving its functional purposes. Apple knows this well, which is why it paid close attention to the materials used for the construction of the watch, as well as the plethora of straps that are being offered. 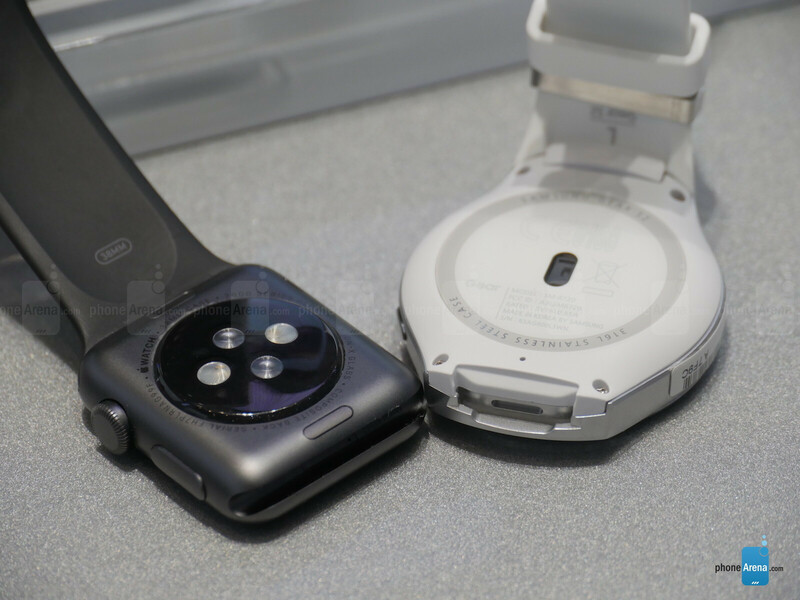 However, Apple also thought about the practical side of things, which is why it decided to launch the Apple Watch with a rectangular display, rather than a circular one. When you have in mind that much of the content you're going to view on the Watch is organized in lists, the squarish form of the Apple Watch suddenly starts making a lot of sense. Still, could it be that when it comes to smartwatches, the circular watch face shape actually comes off as the more appropriate form-factor, seeing that they still have to live up to certain stylistic criteria? That's certainly our thought now that we have the Gear S2 in front of us. Samsung's timepiece sure looks beautifully simplistic, and undeniably modern at the same time. Of course, it'll be subjective whether a user prefers a circular or a rectangular watch, but at this point we're beginning to lean towards Samsung's vision. As you can see in the images, both wearables' AMOLED screens are downright beautiful. Producing nice and crisp shapes and forms, their vivid and contrasty colors paint images that can make you forget you're staring at a wearable's tiny display. Both are touchscreens, so you can operate the Apple Watch and Samsung Gear S2 with your fingers, but why would you want to do that when they attempt to provide you with some funky interface tools of their own to help you enjoy content without your fingers obstructing (and smearing) your view? 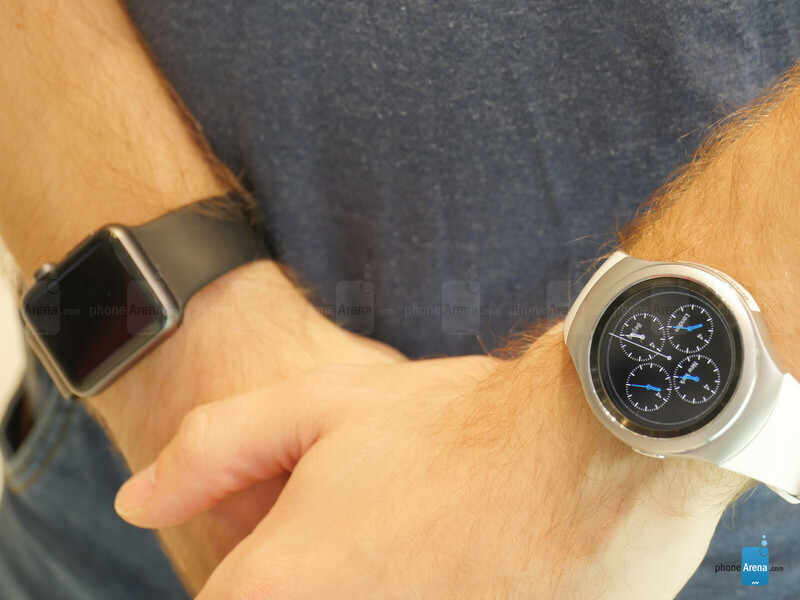 Anyway, both screens appear fascinating, through we'd give a slight edge to the graphics the Gear S2 delivers, probably because of the more advanced and sophisticated nature of Samsung's Tizen user interface, along with the stylish circular shape. Rotating bezels and Digital crowns: the future against the past? The Apple Watch is now a familiar thing. It's proven to be the typical Apple affair, complete with a closed platform representing the company's unique vision with regards to smartwatches. Apple has crafted a neat system that serves its purpose relatively well, but is by no means free of troubles. We've already gone through the major problems found with Apple's Watch OS, and we believe that if the Watch is to keep its current lead in the market, Apple might want get its Watch OS development process moving faster. Meanwhile, Samsung may not yet enjoy Cupertino's financial successes with its wearables, but it has sure been generating expertise in the field during the last few years. And now the the Watch has arrived, Samsung has obviously gotten all the more motivated to prove its worth on this frontier as well. In other words, Samsung seems to have put crazy amounts of effort into the software of the Gear S2, and the results are spectacular. Not only has Samsung found answers to some of Apple's key differentiators, but it has also engaged its full innovation potential, producing impressive ideas and features of its own. As you can imagine, the rotating bezel proved to be an invaluable interface tool, simply because it enables us to quickly make our way from one end of the UI to the other and back in mere seconds. And while Apple's digital crown –– which admittedly also works well –– tends to come off as a bit of a retrograde form of operation, Samsung's rotating bezel is just the opposite – it still involves the manual operation of a mechanism, but manages to feel rather futuristic and satisfying. So, the score is pretty much 2:0 for Samsung at this point, but wait till we tell you that the Tizen software of the Gear S2 also manages to attract us more than Apple's Watch OS. Apple's simplistic GUI approach with Watch OS is conductive in the context of using a smartwatch, but Samsung's UI is just as clean and optimized for usage on such a small screen. 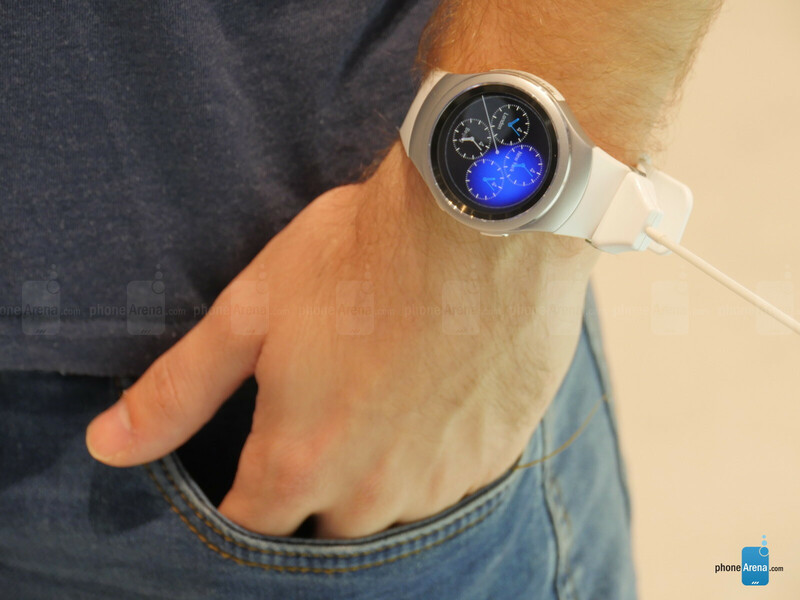 So what differentiates the Gear S2 then? Somehow, Samsung has made smarter use of the limited space on the watch's display, creating a UI that's as playful and rich as it is simple and approachable. It's an impressive mixture of visual goodness and practicality that ultimately makes the Gear S2's Tizen a more inspiring and developed platform. Just look at how the icons in the applications screen are arranged in a neat, circular formation, making them easy to browse with the rotating bezel, and creating a sense of coherence! The same goes for the superficial circular arrangement of the widgets that reside east of the watch face. It's an ingenious solution that proves Samsung currently has the will to push through and deliver the better experience on a wearable device. An impressive feat, indeed, especially considering that the UX area has long been among the weaker aspects of its smartphone portfolio. Not only has Samsung gotten the user interaction right in the Gear S2, but it has also managed to pack a ton of useful and deeper-than-average functionality in its most ambitious wearable yet. From its functional and diverse watch faces, through the pretty and concise widgets, all the way to the rich applications such as S Health, Weather, Calendar, and Mail – Tizen's latest incarnation appears to include a stylish, fun, and comprehensive set of software features to really make the Gear S2 the complete package it deserves to be. At the same time, the Apple Watch by no means comes with barebones software. Apple's has made sure to deliver strongly on the software side of things, with must-have premium smartwatch features like an enticing activity app and support for standalone programs. We believe both wearables are pretty comparable when it comes to their feature sets, but it's the Gear S2 that tends to present its functionality in a more effective and straightforward way. Apple fumbled in delivering the traditional attributes of its software, such as utmost simplicity and intuitiveness, with the Watch, and now Samsung has managed to take the lead in the area, and in a decisive manner at that. Since its launch earlier this year, the Apple Watch has become the most popular smartwatch out there, partly because of its intricate execution, and partly because it's been relying on the Apple image. However, its task is going to become immeasurably more difficult when the Samsung Gear S2 and Gear S2 classic launch in the beginning of this October. Samsung has come up with a winner, and the company knows this. We guess that's why Samsung wants to avoid taking any chances, which is why it's making its latest Gear watches available to not only a select range of Galaxy smartphones, but pretty much any Android 4.4+ smartphone that happens to pack at least 1.5 GB RAM. 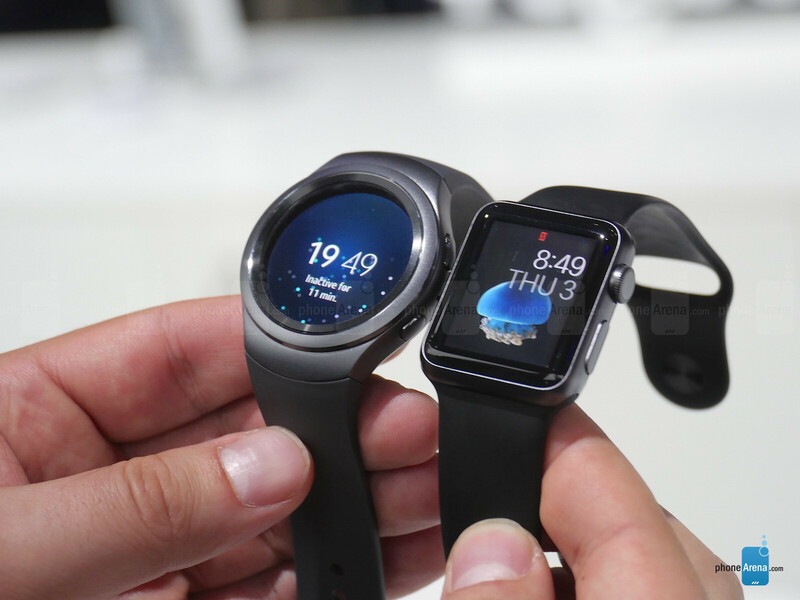 What's more, we've been hearing that Samsung may be looking into bringing the Gear S2 to the iPhone in the near future, which is still unconfirmed information, though. However, if this happens, similarly to how Google managed to bring Android Wear support to iOS, Apple's Watch might be in for a great trouble, seeing how the Gear S2 consistently comes off as the better device in so many areas. 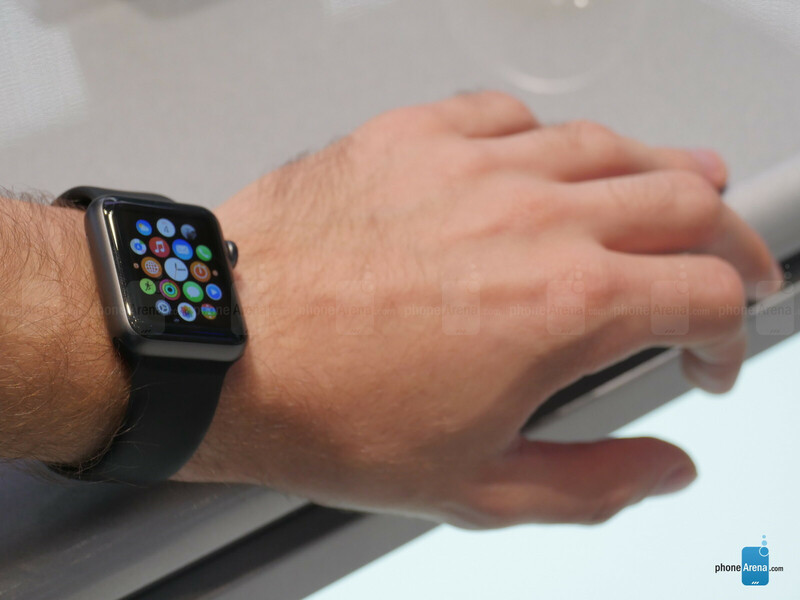 Omg, that black apple watch looks like a plastic toy that you could find in a cereal box. You actually agree? Wow! I am totally surprised. Let me ask, does the S6 Edge look better than the iPhone 6? Does the Edge Plus look better than the iPhone 6 Plus? Definitely Yes. S6 Edge looks way sexier than the iphone6/6s. Yes. seriously it does look better Yes. preference is very subjective. This the most beautiful and software wise most intuitive of all crowded smart watches currently in the market. I don't need to read the reviews to know that Samsung have a created a very good product here. Am a blackberry user but am still getting this smart watch regardless if it connects with my blackberry or not. The standalone 3G version is a must buy for me. Finally Samsung nailed it! Full marks for the rotating bezel. The 2 versions of Gear S2 complements the premium smartphone offerings S6/Note5&edge version and looks set to sell far better than its predecessors. The guy who wrote this article should be shot! This watch will sell about as much as all the other Gear watches. Also, exactly what does it do better? Rotating a dial is no better than the crown. To be honest you won't use either that much. It's good for zooming in and out and scrolling up menus but that's it. You will just swipe for most things. As far as price, who will buy starting at $350? Android users don't spend that type of money. Especially on smart watches. I know a guy who has an inflatable donut is you'd like to borrow it. Sales do not equal quality. I'm assuming you're talking to me. Tell me, what is special about this watch? There are a million round watches on the market right now. This watch is not even better than the WahWay watch. Yes I spelled it that way. This is nothing but tech journalist wanting so bad for Samsung to compete against Apple. The last thing they want is Apple to run away with this thing. Don't get caught up in the hype of these sites. In the real world, this thing will be sitting on shelves. Ask Moto. Remember that hype? How ironic is that the best selling and most successful smartwatch is being labeled a flop by tech sites. Step into reality my friend. Sounds like the donut won't be enough. Better get some cream, too. I swore he just wrote sales don't equate to quality and you completely ignored it. This isn't the Wall Street Journal, this isn't Forbes, this isn't Bloomberg. People at this site wanna know what watch has 3g capability, good activity tracking, phone call capability, ip67, and compatibility with their device, while you track sales as if Apple is paying you to be their CFO. One Direction is clearly your favorite music group, they sell a lot. Which one is that? Apple shipped 3M watches, that doesn't mean they sold them all. Right? Isn't hat the iFan driviel when it comes to sells? That shipments dont count as sales? Android Wear I guess shipped about 1M devices. Pebble I guess has shipped probably more than that. Again, if it shipped it sold to distributors or retails, so as long as it shipped it sold. So the next question would be, how many people have actually bought them? 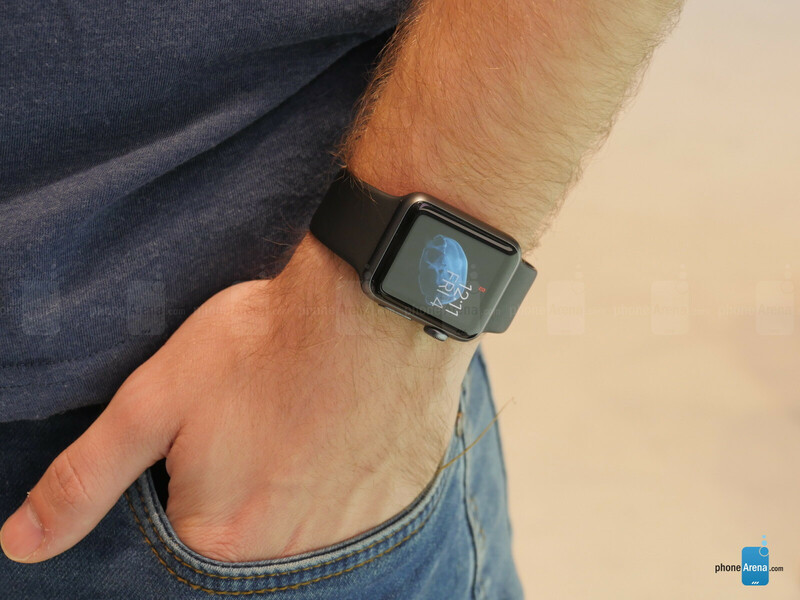 I havent seen an Apple Watch in the wild, or a Pebble. I've seen plenty of Fitbits, the original Gear, Gear Fits and Gear S'. It seems these arent selling much at all because I live in the 3rd largest US city and I get around quite a bit and I dont see these devices. Media hype and consumer hype are not the same thing. Cool down, let people who want to spend, buy the watches. Rotating dial is good coz it helps to keep the fingers cover the screen lesser number of times. That's what the digital crown is for and it does it extremely well. This is just a different way to do the same thing. As a Apple watch owner, I know that this feature is something you don't use much regardless. With smartwatches, you barely fiddle with it. You glance at it or dismiss things 90 percent of the time. I have read so many sites saying rotating the dial is so much better than the crown. I beg to differ. Who cares if you beg to differ? Who are you? You are a nobody that no one cares about. Do you own a major tech site? Do you have millions of viewers? You are just another Apple cheerleader posting because they are jealous that reviews are saying the rotating bezel works better than the crown. Please go back to enjoying your fake Casio knock-off watch. Samsung watches didn't use Apple's crown. They did some innovate ideas by using the rotating bezel, which is much more useful than the tiny crown. It's a more elegant, more intuitive solution. Unlike apple samsung has made this whole UI based on rotating bezel....which makes it extremely easy to use..
Ok. So beg to differ an be happy. You love how Apple does everything and you're basically blind to anything else if is not done the Apple way. Typical fanfare. A dial a moving bezel. Same mechanical capability. Is the dial better than the crown? They have their opinion you have yours. IMO the lame crown, is the same way we used watches since the Timex. All Apple did was make it bigger and its ugly too. What makes the dial better is it is a new way to use a watch. The winding mechanism Apple is using is simply familiar. It breathes dinosaur technology. All manual watches use the same mechanism to set the time and stuff. It's old. The best Apple could do with 200BN is make a watch that essentially works the way we have known watches to work. Its nice to be familiar, but it isnt novel or unigue. A dial is larger. Sure it does the same thing, but its never been done on a watch before. Its better because its different. Its a bit more novel, but yet still familiar. I am curious as to what you would say if the watches were with reversed brands. If Samsung did the crown thing and Apple did the dial thing, and we said the crown was better; you'd swear the dial was better. But because Apple didnt do it, its somehow not better. You sound extremely jealous, which is sad and pathetic. The Apple watch is a flop and failure. This S2 will be the best selling Android watch. There are more high end Android phones being sold all around the world in total than there are Apple phones. You are clueless. Well first off, none of the Android based smartwatches cost more than $299, so yeah its not that we wont pay; we just don't have too. The great think about competition on platform sharing. I paid 299 for the original Gear. I should be shot for that for such a limited device. I paid 199.99 for my Gear S on contract saving $100. Is it worth it? Well considering it has 3G, WiFi, UV, BT and more; and it is a full standalone device that is actually a phone; I would say paying 50% for a phone to wear is a reasonable price. What you should be saying an looking at instead of trolling Android/Samsung; Apple has 3 years to watch what others were doing with their wearables. For Apple to release this limited piece of junk with no 3G making it be tied to the phone, which Samsung was criticized for, for the first 3 gear models is absolutely pathetic. All that BS about Apple talking to SWATCH who actually makes nice looking watches and Apple releases this ugly boring 17th century design with over $200BN in the bank is just lame. You trying to tell us what we won't pay. Fact is you have no idea what we will pay, because we already know you iFans will pay whatever Apple asks and then criticize what someone else will and wont pay for something. I would pay $350 for a smartwatch if it actually brought somethign worth it to the table. I am betting Samsung will still sell this for 299.99, undercutting Apple and with the added factor of Android compatibility, its a WIN. Apple shipped 3M of their pathetic junk. How many did they actually sell? I dunno. What I do know is I have not seen anyone wearing one anywhere. The only place I have seen them is at the Apple Store and I played with it. It looks like a watch you can buy a DisneyWorld. "Also, exactly what does it do better? Rotating a dial is no better than the crown." Are you serious dude? Rotating dial is my easier to control than a tiny crown.